Of the four swallowtails resident in Massachusetts, the Spicebush is the second most common, and perhaps the most beautiful. The species was described quite early, by Linneaus, from a specimen procured by Peter Kalm during his 1748-1751 travels through the mid-Atlantic states. Scudder called it the green-clouded Swallowtail, and in the 1880s found it to be “not an uncommon species in the three southern [New England] states, even in Berkshire County, Massachusetts.” It was usually found “in damp open woods and about marshy thickets;” in northern yards the first brood was attracted to lilac and laurel blossoms (Scudder 1889: 1321). Thaddeus W. Harris had a specimen in his 1820-6 collection from “the vicinity of Boston,” was raising Spicebush Swallowtail as early as 1822, and describes the species in the 1862 edition of his book. Maynard (1886) found it “common in Massachusetts.” Veteran collector F. H. Sprague took a very large number of specimens in 1878: 4 in Wollaston near Boston (May 25, 28, June 10, 13); 2 in Belchertown (6 and 8 July), and 12 in Leverett (July 18 – August 5) (Sprague 1879). Some of these can be seen today in the Harvard Museum of Comparative Zoology. Scudder (1889) does not list other specific locations for Spicebush Swallowtail, probably because it was so widespread and easy to find. By 1934 Farquhar describes Spicebush Swallowtail as still “General and not uncommon in Mass, RI and Conn; rare in Maine, N.H. and Vt., absent from the northern portions of all three.” At the Harvard MCZ are specimens from Tyngsboro 1915, Weston 1920, and Barnstable 1952. In the Yale Peabody Museum are specimens dated 1921 from Canton and Melrose, and one late-1930’s specimen from Martha’s Vineyard (July, n.d., F. M. Jones). For Martha's Vineyard in the 1930's and early 1940's Frank Morton Jones described Spicebush Swallowtail as "frequent", with larvae found on both sassafras and spicebush trees, but for Nantucket Charles Kimball reported it as "rare" (Jones and Kimball 1943). At least one historical specimen is found in the Maria Mitchell Museum on Nantucket (LoPresti 2011). The Spicebush Swallowtail probably became common as a result of two centuries of agricultural clearing and woodlot management (Table 1). It may have been scarce in the pre-settlement forests, since even today it is not often found in rich, moist, heavily-canopied forests, such as those in western Massachusetts. Spicebush eggs are laid preferentially on young saplings of its two host trees, Spicebush (Lindera benzoin) and Sassafras (Sassafras albidum). Thus periodically disturbed edges, cut woodlots, and early successional areas provide the most caterpillar habitat. This species is well-adapted to edges, and small wooded parcels with adjacent yards and gardens. It benefits from the establishment of corridors linking areas of conservation land. It needs some open areas with nectar sources such as bee-balm, cardinal flower, and joe-pye weed. It probably did not decline greatly during the post-1850 period of urban industrial development in Massachusetts, and suburbanization may even have increased habitat for it (Table 2). Large yards with nectar sources such as lilac, bee-balm and phlox, and a spicebush or sassafras tree, can provide habitat if woods with additional host trees are nearby. Spicebush Swallowtail uses only its two native host trees, and has not found it necessary to adopt any new non-native hosts. Thus it is not a Switcher (Table 3). The population status of the Spicebush Swallowtail may not be much changed today from Scudder’s time. The woods and woods edges which have re-grown since the agricultural era often include the Spicebush Swallowtail’s two host trees. Its habitat of edges and small wooded parcels with adjacent yards and gardens is prevalent. MBC 2000-2007 data rank Spicebush Swallowtail as “Uncommon to Common” relative to other species (Table 5). Note that, like the Black Swallowtail, it is not unequivocally “Common,” and certainly is not “Abundant,” relative to other species. The Massachusetts 1986-90 Atlas also found this species “fairly common to uncommon,” about the same as the Black Swallowtail. MBC sighting data do not indicate any significant trend over the last 18 years (Chart 5). The average number of Spicebush Swallowtails seen on a trip compared to the average for all preceding years back to 1994 was up 21% in 2010, 4% in 2009, and 21% in 2008. (E. Nielsen, Season Summary, Massachusetts Butterflies Nos. 30, 32, 34, 36, 2009-2011). The apparent increases result from comparison to two years of low sightings in 1994 and 1995. Overall, a study applying list-length analysis to MBC 1992-2010 data found no marked increase or decrease in the likelihood of detecting Spicebush Swallowtails (Breed et. al. 2012). Spicebush Swallowtail has been reported from over half, or 176, of the 351 towns in Massachusetts 1992-2012. Spicebush can probably be found in all Massachusetts towns. It has been reported from various locations in Boston, including Arnold Arboretum and along the Charles River. Both MBC and Audubon Atlas records indicate that while Spicebush Swallowtail is found throughout the state, it is scarce in towns west of the Connecticut River valley and much more common in eastern and central areas. This uneven distribution was indicated in the 1986-90 Atlas map ( http://www.massaudubon.org/butterflyatlas/index.php?id=7 ), and is still evident in 1992-2012 BOM-MBC data. The Atlas found Spicebush in only three southern Berkshire towns: Egremont, Great Barrington, and Sheffield. MBC 1992-2012 data show sightings from eight towns scattered throughout Berkshire County: Cheshire, Monterey, New Ashford (Mt. Greylock), New Marlborough, Sheffield, Stockbridge, Williamstown, and Windsor (Moran WMA). The numbers of Spicebush Swallowtails reported from Berkshire County are quite low. A comparison of NABA Count data over five years (2004 through 2008) shows an average of only 1 Spicebush reported from the three Berkshire Counts (Northern, Central and Southern) each year (.3 for each count), compared to an average of 22 for all the counts statewide (6.8 per count) each year. And, out of 1736 Spicebush individuals reported statewide for 1992-2009, only 15 are from Berkshire County, most from the southern part. Thus, Spicebush is present but uncommon in the Berkshires. It is somewhat more common in the hill towns (a photo of a Spicebush in Cummington, in the foothills of the Berkshires, may be seen at http://www.pbase.com/barbaraspencer, under 2010 photos), and in Franklin County, and more common still in lower Connecticut River valley towns. In contrast, the number of Spicebush Swallowtails reported on Cape Cod and Martha’s Vineyard NABA counts is often particularly high. The species is quite frequently reported, in good numbers, from nearly all Cape Cod towns. But it still appears to be rare on Nantucket; there is only one recent report, 8/12/1988, B. Cassie, from the Atlas period. Spicebush Swallowtail has two overlapping broods in Massachusetts, and possibly a partial third in some areas. According to MBC data, the flight dates are early May through mid-October; see http://www.naba.org/chapters/nabambc/flight-dates-chart.asp . The peak flight period of mid-July probably includes both late fliers from the early spring generation and freshly-eclosed individuals from the summer generation. Earliest sightings. In the 23 years of BOM-MBC data 1991-2013, the six earliest “first sightings are 28 April 2012 Carver Myles Standish SF, M. Arey; 3 May 2010 Hingham, E. Nielsen; 3 May 2003 East Longmeadow, K. Parker; 4 May 2004 Woburn Horn Pond Mountain, B. Wright; 4 May 1991 Worcester Broad Meadow Brook, T. Dodd; 5 May 2013 Stow Delaney, S. Moore; 5 May 2008 Westfield T. Gagnon and B. Callahan. The particularly warm springs of 2012 and 2010 produced new early flight dates. In nine of the 23 years, the first sighting of Spicebush Swallowtail was in the first week of May (5/7 or prior). In seven of the 23 years, the first Spicebush was seen in the second week in May, and in the remaining seven years the first sighting was after May 14. It is probable that the spring emergence of Spicebush Swallowtail in Massachusetts has become earlier over the years, but Scudder does not provide any data for comparison, and his mention of “the first half of March” for southern New England (1889:1325) may be a misprint, since even in Connecticut today the adults do not appear until the beginning of May. In 1878, F. H. Sprague listed the date of earliest appearance in Wollaston that year as May 25 (Sprague 1879). The majority of MBC dates are earlier than that. Very few of the May sightings occur north of Boston in Essex County; most first reports in this county are in June. Examination of 1991-2010 MBC records for Essex County shows only two Spicebush Swallowtail sightings in May, even though there were many May reports south of Boston, as well as inland further west. A later spring, especially at the coast, is probably to blame. The onset of the spring Spicebush flight is also delayed on Martha’s Vineyard compared to the mainland. The earliest Martha’s Vineyard sighting in MBC records is June 5, 1999, Edgartown Norton Point TTOR, A. Keith. Matt Pelikan believes that the usual date for the beginning of the Spicebush flight on Martha’s Vineyard is “early June” (M. Pelikan, pers. com. 2009). The spring generation of Spicebush Swallowtail varies from year to year in size and flight onset, probably because New England spring weather is notoriously variable. The swallowtails apparently continue to emerge from the chrysalis at varying times all through May and June (Scudder 1889: 1325). This may reflect a strategy of choosing optimal “emergence windows,” to avoid being decimated by erratic weather patterns (Pavulaan, masslep, 7/18/2009). The result is that there is often no clear flight time gap between the first and second broods, and different age groups of caterpillars may be found feeding at any one time (Jaffe 2010). Latest sightings. In the 23 years of BOM-MBC data 1991-2013, the seven latest “last sighting” dates are 31 October 1999 Gloucester, D. Savich and C. Tibbits; 21 October 1995 Gloucester, D. Savich and C. Tibbits; 20 October 1994 Gloucester, D. Savich and C. Tibbits; 12 October 2008 Westport Gooseberry Neck, F. Model; 12 October 1997 Cape Ann, D. Savich and C. Tibbits; 10 October 2010 Brookline, T. Kesting-Handly; and 10 October 2006 Newbury, S. Stichter. 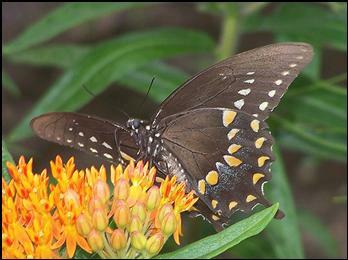 In 13 of the 23 years 1991-2013, including 2010 – 2013, Spicebush Swallowtail has been seen flying into October. Many of the late sightings in the 1990’s were in Essex County; recent last sightings have been 10/2/2013 Wellfleet, M. Faherty, and 10/5/2012, Worcester, M. Gach. Scudder does not provide any 19th century data for comparison. In warm dry autumns Spicebush Swallowtail may try for a third brood, and perhaps the years of October sightings reflect a partial third brood. But the success of any late brood is jeopardized if hot dry weather dries up spicebush and sassafras food sources (D. Adams, masslep, 8/1/2009). With a large range throughout the southeastern United States, and two widespread host plants, this species will probably not be negatively affected here by climate warming. Those familiar with this butterfly in Massachusetts are sometimes surprised to learn that it is quite rare in Maine, and seemingly in New Hampshire as well. In Maine it is a Special Concern species. Recently, a breeding population has been discovered in southern Maine (Ward and deMaynadier 2011), and the species is no longer a "rare stray", as formerly thought, but is now a "breeding resident" ( http://mbs.umf.maine.edu/Butterfly%20Species%20List%209.htm ). Like most butterflies, the Spicebush Swallowtail will not flourish in the heavily urban, dense suburban, and industrial environments which have spread in Massachusetts since 1900, and would be threatened by increases in these trends. At the other end of the habitat spectrum, Spicebush Swallowtail is not a deep woods species either; it requires sunny woods openings, roads and edges rather than closed-canopy forest. Its presence is compatible with ecological forest management and with light suburbanization. NatureServe lists Spicebush Swallowtail's Massachusetts status as S5, or secure. Its host plants, especially Lindera benzoin, make attractive yard plantings, and many garden flowers provide useful nectar. The smooth caterpillars are easy to find and unfailingly photogenic. Many people enjoy raising them. Along with the Monarch and the Black Swallowtail, the Spicebush Swallowtail is an important ‘butterfly ambassador” to the human world.